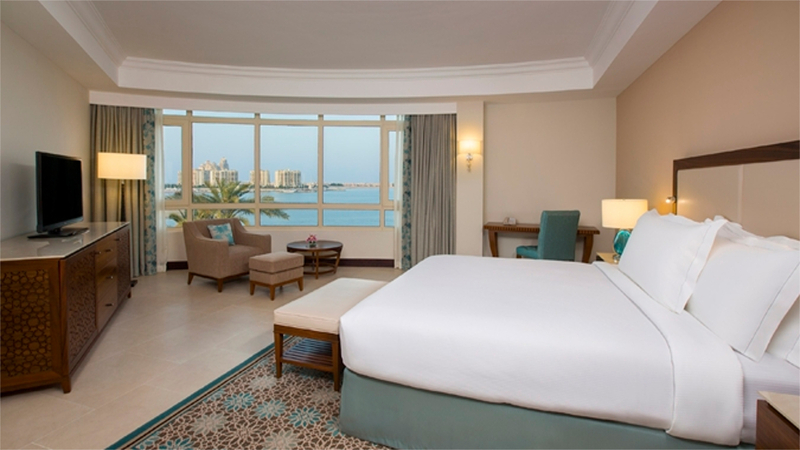 A luxurious display of Hilton chic, Hilton Al Hamra Beach and Golf Resort overlooks the stunning Arabian Gulf on the beachfront of this exclusive Ras Al Khaimah destination. 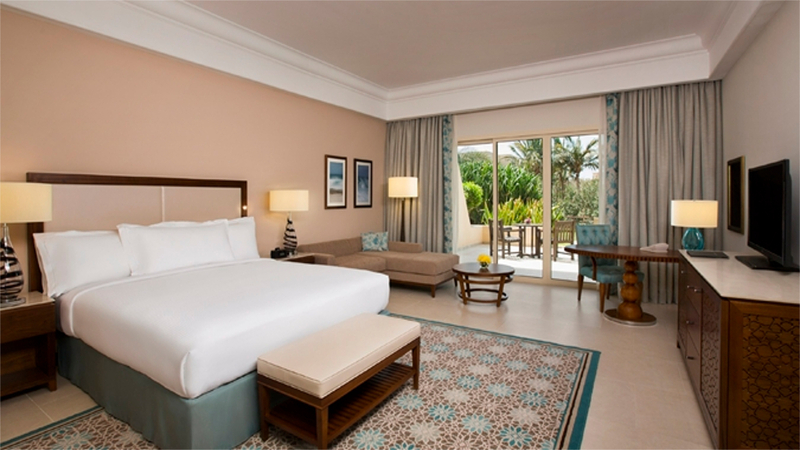 Boasting superb facilities for fitness and health, a luxury spa, children’s fun and entertainment, a whole host of water sports, plus access to an 18-hole championship golf course, Hilton Al Hamra is the perfect choice for Ras Al Khaimah holidays. Relax in superior rooms and suites that offer plenty of space and contemporary design. Tranquillity at its finest! 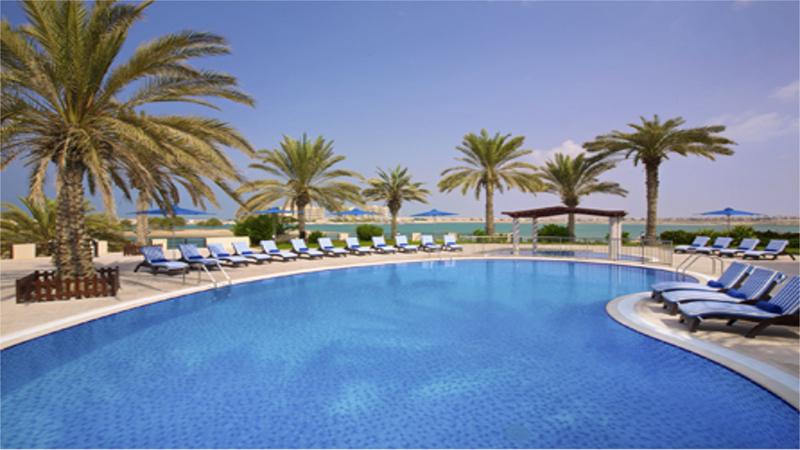 Hilton Al Hamra Beach and Golf Resort is located directly on a beautiful stretch of golden sand. This luxurious 5-star resort boasts numerous restaurants, bars, a spa and an abundance of fantastic facilities. 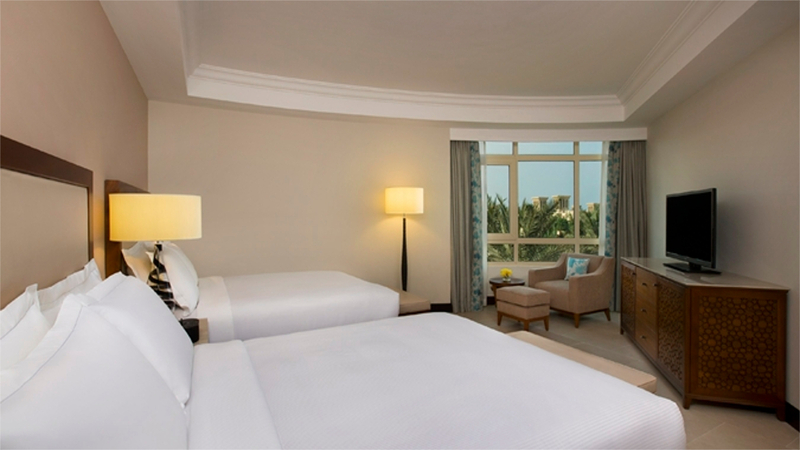 This makes it an ideal place to unwind during a holiday in peaceful Ras al Khaimah. Guests have access to the Al Hamra Golf Club, located next to the resort, which has a championship standard par-72 course. If you fancy exploring the area, Al Hamra Mall is within walking distance about 1.5km away, where you’ll also find a cinema, while the centre of Ras Al Khaimah and Manar Mall is 20km. A popular family day out at Ice Land Water Park is approximately 6.5km, or you can experience authentic desert life with a trip to the Bedouin Oasis Camp, 45k away. Ras Al Khaimah International Airport is approximately 20-minutes’ drive, while Dubai International Airport is about 50-minutes away. Mesmerising views from the private balcony are enjoyed in this luxury room which offers 44 square metres of living space and accommodates 2 adults. 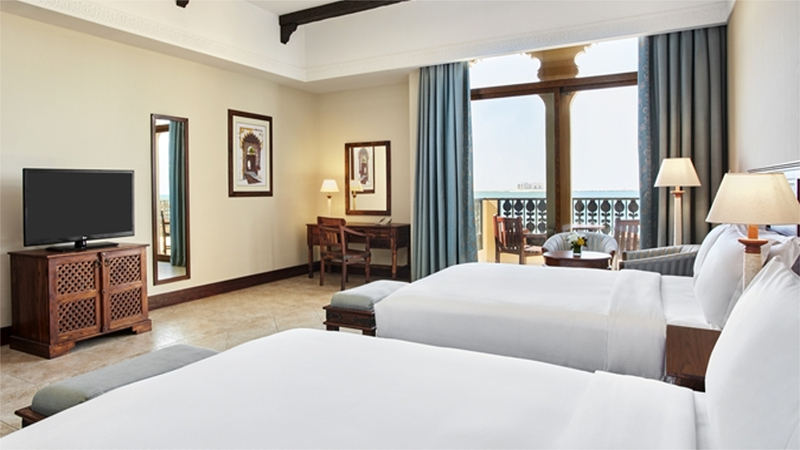 King Superior offers wonderful views of the gardens and lagoon or guests can select the sea view rooms. A private balcony, seating area and sofa bed plus all of the in-room features apply to this class which provides 29 square metres of space in which to relax. 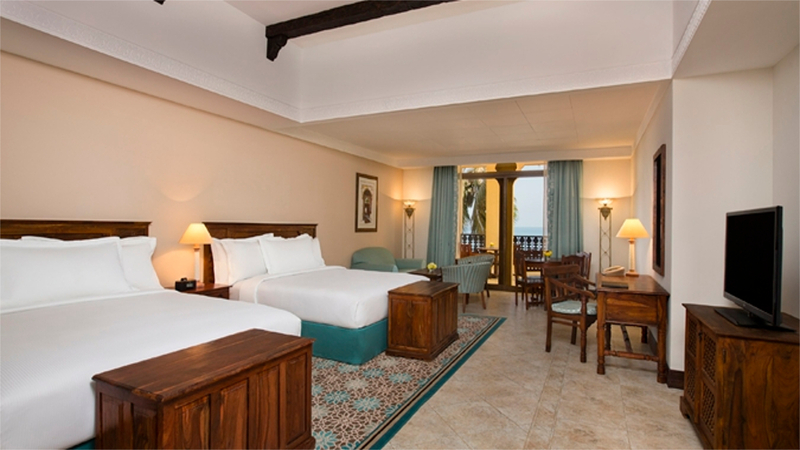 Guests can also choose the garden view rooms which offer 42 square metres of living space. 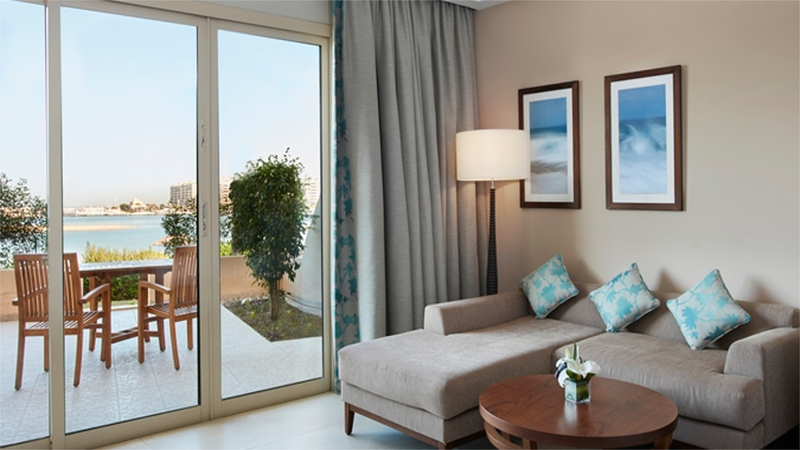 Alternatively the sea front rooms are perfect for relaxing balcony views and great proximity to the beach. 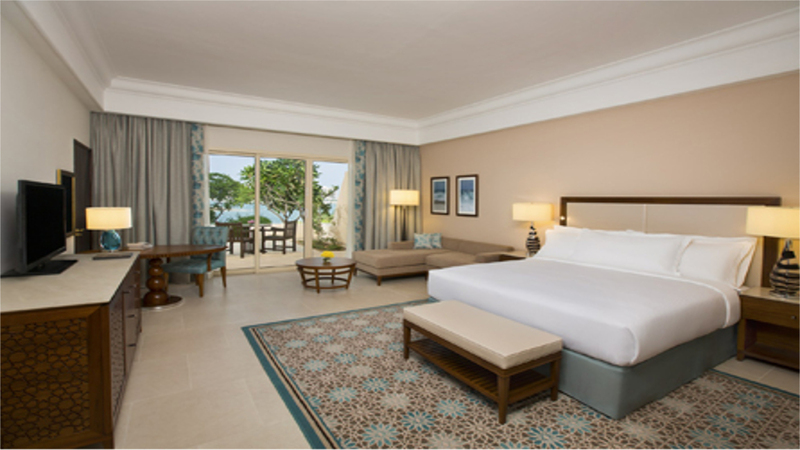 Relax amidst a well-appointed room featuring two double beds, and luxurious bathroom with separate tub and vanity area. The room is 29 square metres in size and incorporates a seating area, sofa bed and balcony. Up to 2 adults and 2 children can be accommodated. Stunning views and direct access to the beach is offered from this luxury room featuring a balcony, bathroom with separate tub and shower plus vanity area, and two double beds. This class easily accommodates 2 adults and 2 children. Relax amidst 48 square metres of elegant space featuring a seating area, separate tub in the bathroom with vanity area, and fantastic tropical garden views from the balcony in the Garden View rooms. A contemporary room choice with plenty of space allowing for a seating area, spacious bathroom with vanity area and standard amenities and two double guest beds, this room choice is ideal for up to 2 adults and 2 children. Panoramic views of the hotel pool and ocean can be enjoyed from this class. Enjoy a great space ideal for up to 3 adults with the King One Bedroom option. A vanity area, bathroom with shower and tub, a lounge and dining area plus gorgeous sea views from the balcony aids the luxury feel of this suite. 75 square metres of accommodation is equipped with all of the standard amenities. A beautiful example of space and contemporary design, Hilton presents a fabulous junior suite with separate living room and dining area. Accommodating up to 5 adults, the suite offers two king-size beds, an oversized bathroom with tub and shower, plus large vanity area. 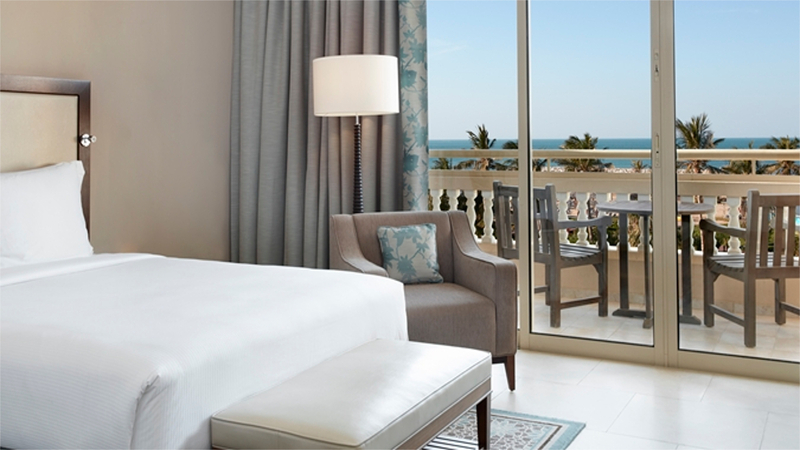 The balcony with sea views enhances the feel of this suite which is a generous 82 square metres of accommodation. A superlative suite, this Presidential choice offers a fantastic rooftop terrace with stunning views. Incorporated into the design is a small kitchen, dining area and separate lounge. 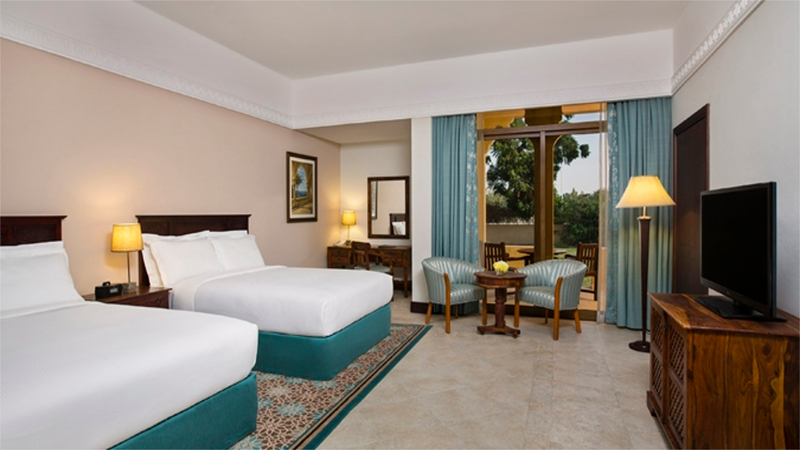 The room features a spacious bedroom area with king-size bed and at 187 square metres, it is the largest in Hilton Al Hamra’s accommodation. Start the day in style with delicious buffet breakfasts, linger over lunch and relax over a fabulous dinner of world cuisine. The exquisite menu choices combine to create an array of flavoursome dishes from light bites and quick eats to several courses and unique masterpieces. Live entertainment is also available during the evenings. A warm atmosphere exudes from this Lebanese restaurant with alfresco dining also an option. Live music and belly dancing is hosted in the evening with the restaurant remaining open until 1 am. Taking inspiration from the street markets of the Middle East, a fusion of cuisine including some delicacies is cooked to perfection in this show kitchen venue. Serving light fayre and tropical cocktails and juices, this casual beachfront restaurant is located alongside the pool terrace and remains open until 6pm each evening. Relax and socialise as you linger over specialty coffees, teas and treats. Reminiscent of a Cornish village pub with a modern feel, here is where traditional pub beverages, light meals and sporting action can be enjoyed. Sporting events are televised here and the pub is open until midnight. With a Polynesian theme, this is a great venue for cool relaxation and unique cocktails. Considered a chill-out lounge, it’s a great contemporary venue. If you choose to go all inclusive, the programme generally consists of breakfast, lunch and dinner, all buffet style, served in the main restaurant. During meals soft drinks, beer, water and wine are usually offered. Locally produced alcoholic and non-alcoholic drinks like water, wine, soft drinks, beer and spirits are usually served from 11am to 10pm (except during meal times).